One of my favorite things about Autumn is the color. This past week my husband and I drove with friends in our sports cars and went over Independence Pass and Boreas Pass to look at the beautiful Aspen leaves which had changed colors from green to golden yellow and some were even burnt orange. It was beautiful! I also love getting out my fall quilts. This first one is not a miniature but it was made from fabrics gathered at the Colorado 2008 Shop Hop. I am reminded that fall is coming when leaves are falling and pumpkins are on the ground. 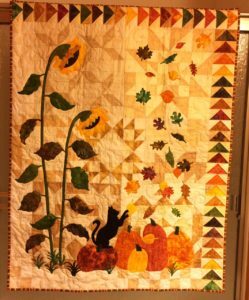 I seem to have a collection of not only little quilts but long skinny fall quilts that I want to share with you. They fit so well on tall wall spaces or pillars in the house. This pumpkin, grapes and leaves piece is all machine appliqued. It went together quickly and looks so good. The next one is similar but reminds me of all the amazing wild life we have here in Colorado. Not that I want to see them up close but I love the Bear, Deer and Moose. Best of all is the next quilt which features just leaves. I remember when I was 8-9 years old and used to walk to school and back every day in the fall. We lived in Lincoln, NE and had many oak and maple trees which turn magnificent colors in the fall. I would come home with my pockets full of orange, red and yellow leaves. This little quilt reminds me of those happy days. It features a nice sampling of different shapes of leaves. This last one I just created this month. The first one I made had three 5” blocks and turned out cute so I decided it might even be cuter with 2.5” blocks. This little pumpkin quilt is the result. It finished at only 4” x 11.5”. It fits almost anywhere. When it comes to quilts I guess I believe smaller is better! ← Letter S News – a Double Sale and more…..